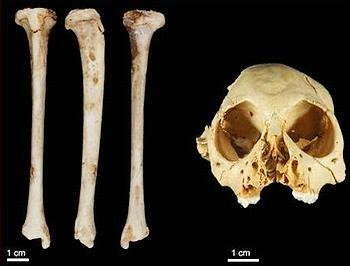 SANTO DOMINGO, Dominican Republic, September 4, 2015 (ENS) – The fossilized bone of a monkey that lived 1.3 million years ago has been found in an underwater cave on the Caribbean island of Hispaniola. A team of cave divers recovered the fossil shin bone belonging to an extinct species of monkey, Antillothrix bernensis, from Padre Nuestro cave in the easternmost province of the Dominican Republic. 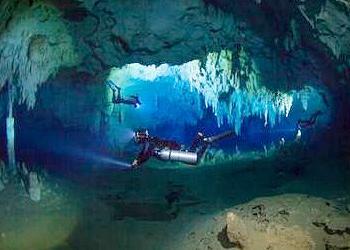 Cave divers Cristian Pittaro of Argentina; Phillip Lehman of the UK; Dave Pratt of the United States; and Victoria Alexandrova of Russia, all founding members of the Dominican Speleological Society, discovered the fossilized bone in the dive cave on the island’s southern shore, about 70 miles, 112 km from the Dominican capital, Santo Domingo. The Hispaniola monkey, Antillothrix bernensis, is thought to have gone extinct around the 16th century. The exact timing and cause of the extinction are unclear, but scientists believe it is related to the settlement of Hispaniola by Europeans in 1492 after discovery of the island by Christopher Columbus. The species was roughly the size of a small cat and lived in trees, eating fruits and leaves. These small monkeys were likely still on Hispaniola when humans first colonized the island, says a scientist involved in the discovery. The fossil bone discovery was made possible by the collaboration between the Dominican Speleological Society, the Museo del Hombre Dominicano in Santo Domingo, and Brooklyn College, City University of New York. Dating of the fossilized bone was conducted at Grand Valley State University in Allendale, Michigan. “We know that there is a diverse extinct fauna on the Caribbean Islands, but dating the material has been difficult,” said Melissa Tallman, assistant professor of biomedical sciences at Grand Valley. Tallman says the structure and form of the bone, known as its morphology, identifies the monkey as Antillothrix bernensis, and dating of the rock where it was found embedded identifies how long ago it lived. The fossil was embedded in a limestone rock that was dated using the Uranium-series technique. Tallman said since the days of Charles Darwin in the 19th century scientists have been puzzled over the age of primate fossils from this region.